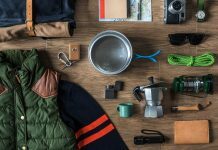 Do you want to eat your meals comfortably while being on a camping trip? Then having camping tables is an absolute must. 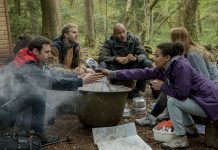 Foldable or not, large enough to fit a family or simply light and practical, the camping tables are something you must have with you while camping. 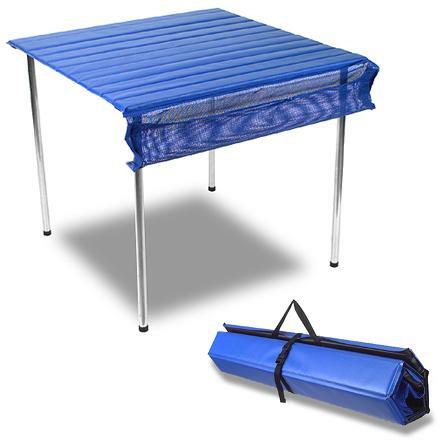 In case you are preparing for camping with your family, then this might be the table that you have been looking for, because it has just the right size. It can seat 6 people comfortably. It comes with power-coated frame, aluminum top and six leg braces. You will also get a tablecloth that is PVC coated to make it easier to clean up after the meals. It is easy to fasten it on the table and so you can be sure that it won’t get blown away in case you are in a windy location. 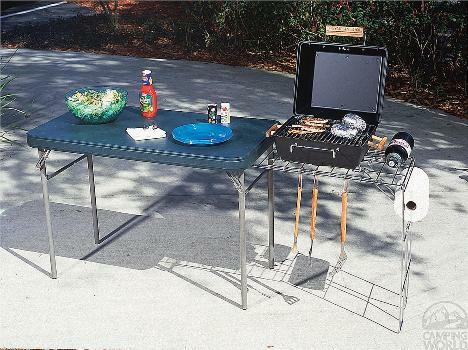 The advantage of this table is that it is easy to set up and it will become the core item of every outdoor kitchen. The top is made of vinyl covered wood and it is resistant to water, abrasion and mildew. It is easy to remove the top of the table and the table is easy to fold and to carry it around. 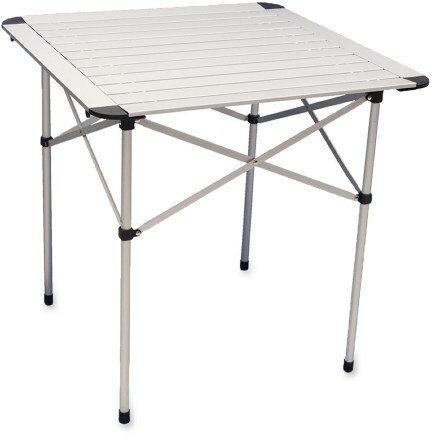 The legs of these camping tables are made of aluminum alloy. There is also a pouch included in the set to store the legs. Remember that the weight limit of the table is of 100 pounds. In case you aren’t expecting a lot of people while being on a camping trip, then this is the table for you. It is just great for seating four people. It is made of powder-coated aluminum and it is very easy to set up. You will be ready with it in no time, this way saving you time and effort. Once you manage to set it up, it is very sturdy and it offers enough space to place the dishes and place people comfortable around it. 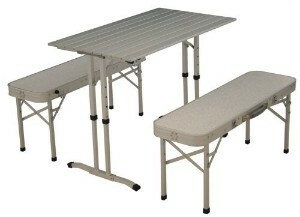 This example of camping tables isn’t heavy and it can be stored in a carry bag. The material used for this table is tensioned nylon mesh that can be easily cleaned and it doesn’t get damaged in case it is left outside in the rain. There is also a pouch that comes with the tabletop to store the most important items and utensils, such as the bottle opener, dining utensils and cork screw. 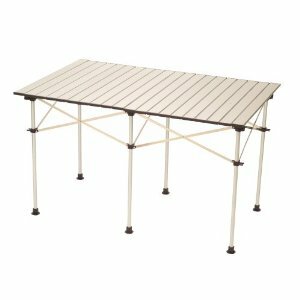 The table offers reliable support due to the steel frame that is powder-coated to make it look nice for many years to come. There are also two integrated cup holders to make sure that there will be no spillage. 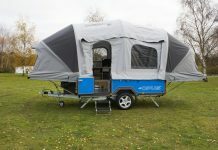 In case you are planning on going camping with only one person, then this might be the table for you. The size of this table is just great for two people and it comes with some surprising features. It is made of anodized aluminum that is suitable even for the most extreme temperatures. 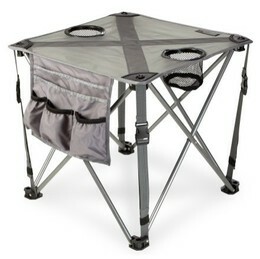 It can hold up to 20 pounds and in order to set it up all you have to do is to fold the legs and the slats. The table can fit into a carrying bag that you can carry on your shoulders. It doesn’t really matter whether you are preparing for playing cards with friends or to have a family meal, this table can be used for many different purposes. 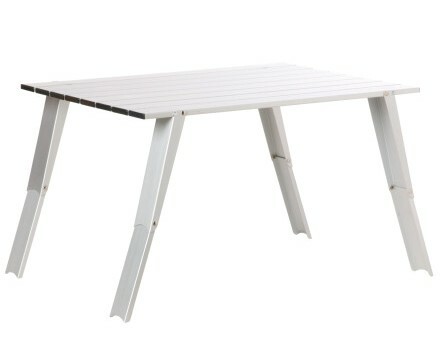 Just as the majority of the tables, this also comes with aluminum legs and slat top that is heat resistant to offer a stable place for eating and having fun. When packed up it needs only little space, but when set up it offers a lot of space for pots, plates and pans. The sack that you have to pack it up in is also included in the set. 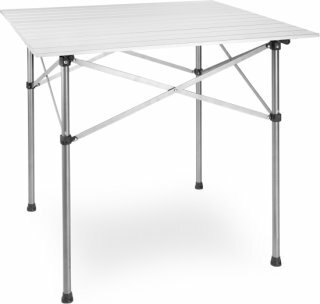 If you are preparing for a trip with many people then most definitely you need one of these camping tables. It is able to seat 8 people so that everybody can enjoy a meal together. If there are kids in your family or your friends have kids you should know that the table and the seating are also child-friendly. There is the possibility to adjust the height of the table so that the children reach it and this way, accidents are less likely to happen. The table also comes with two benches so you won’t have to purchase the seating separately. The thing that makes this table special is that you can adjust its length and you can also level its legs to make sure that you will be comfortable while eating. The surface of the table is made of anodized aluminum and it offers the perfect surface for serving the food. There is no chance for the table to get rusty and it is also lightweight while offering the possibility to fold it to make it easier to carry around. 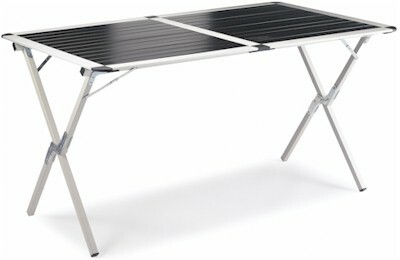 Its stability is given by the X-frame legs, making it a great choice for outdoor activities. Although at first you might think that this table is good only for entertainment and for playing board games, you should know that it is totally functional and you can serve your meals on it anytime. 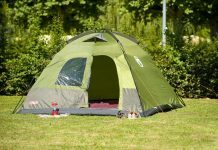 Because of its khaki color it reminds us of the traditional camping accessories. It comes with polyester fabric that can be fastened into the buckles found at the corners. Due to the buckles you have the possibility to adjust the tautness of the table top as you wish. 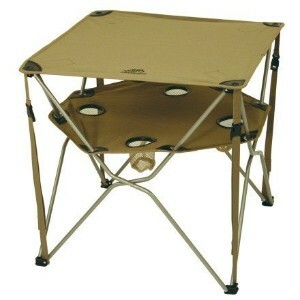 This type of camping tables could be a little more different from all the other tables that you have seen. You can use the table in just any weather because the tabletop is stain resistant and in order to avoid fading and cracking UV inhibitors have been applied on it.